The Cambridge Art Salon is providing the public with clear tools to access our vibrant art scene in Cambridge, promoting equality and encourage diversity within the arts. •	Thousands of Cambridge Art Walk Maps are planned to be distributed all over Cambridge, giving visibility to galleries and art spaces in the community. 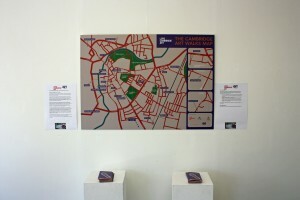 •	A range of exciting artists will have their work promoted to the public through postcards, posters and other media. •	We also plan to provide a rolling programme of free community art classes to the public, bursaries to artists, plus prizes and awards to emerging artists in the community that will help keep the arts open to the public – in all its diversity. The campaign is supported by the Cambridge Community Foundation, Cambridge City Council and Local Giving.